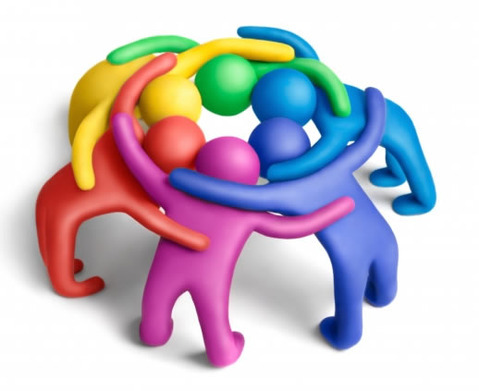 When organising any group event, be it a workshop, discussion forum, or self-help group, you will be faced with the task of uniting individuals. So, how do you start to form a shared identity from these individual people, where everyone knows what the goal is and want to support one another towards achieving that goal? At the core of forming this kind of atmosphere will be to develop rapport with every individual within the group. This is something you can start working on at the outset, and as soon as people arrive – simply welcoming them and asking how their journey was will help ease any anxieties group attendees might have. It also starts to form the foundations of a relationship that you can build on. Even tasks such as housekeeping, icebreakers, and ensuring that people are comfortable strengthens rapport. While the shared purpose and agreed ways of working would have been established at the start, the need to have a valued role within the group is likely to need work throughout the day. Everyone within the group needs to feel that they can offer some kind value. This might require you to facilitate group discussions in a way that ensures everyone gets to have their say, having a quick chat with the quieter members during the break just to check that they are okay, and generally thanking people when they share their thoughts, feelings and experiences with the rest of the group. Eye contact is a great way of building rapport, so try to ensure you have eye contact with everyone throughout the day. All of this is contributing to creating a sense of emotional safety. Often, it is about assessing the group’s needs accurately and acting accordingly. For example, if you have a particularly quiet group, it might be useful to do some pairs work initially and then to introduce group discussions as people start to feel more comfortable. Practical safety is also important in terms of the location, consideration of disability, the provision of refreshments, and even ensuring that the temperature is right – being too hot or too cold is going to impact how people feel within the group. • Unconditional positive regard – this basically means being non-judgmental, so that attendees can openly share their thoughts, feelings, and experiences. • Empathic understanding – putting ourselves in their shoes and trying to understand their specific situation. Even though we can never truly understand how they are feeling, we want to do our best to look at things through their eyes rather than place our own interpretations onto their experiences. • Congruence – we want to be genuine, as this will be picked up and felt by the attendees. As an example, being genuinely pleased to see them when they arrive rather than simply welcoming them because that is what you’re supposed to do at group events. • You have the forming stage, which is when everyone arrives and welcomes one another. • Then there can be a storming stage, where people start to test boundaries and maybe step outside of the shared goals and agenda that were decided in the forming stage. This stage can be avoided by putting time and effort into the forming stage. It really is worth the effort getting the forming stage right in terms of building rapport and building group dynamics, so that you can move towards the norming stage where everyone is comfortable with each other and are getting on with the task at hand. • Ultimately, this will lead to the stage we really want within a group, which is the performing stage where everyone is being proactive in gaining personally from the group and ensuring that others are gaining. They are all supporting each other and inputting into each other’s goals. There is a real team dynamic going on. This proactive approach tells you that the group are picking up new skills that they can implement outside of the group. If you require any assistance with forming groups, or require written content on the topic, please do email me at dr.davies@trustedwriter.com. ‹ You CAN Beat Obesity!